I was browsing through travel journals and the cover of this one caught my eye amongst the more traditional ones. It has colorful drawings of a strange variety of things, like a pencil worn down to the nub, a barber’s pole, a couple of taxi signs written in different languages, and tubes of toothpaste. The title says I Was Here: A Travel Journal For The Curious Minded. I wondered if this was a blank Moleskine type journal that just had a strange cover or if there was something a little more to it. A peek at some of the pages showed that it really was something more than your average travel journal, quite a bit more, and is a lot like what you’d get if you mixed a travel journal with an activity book. 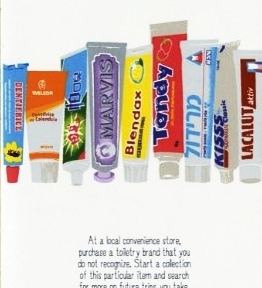 “At a local convenience store, purchase a toiletry brand that you do not recognize. Start a collection of this particular item and search for more on future trips you take. So from what I can tell this is a Wreck This Journal style travel journal. If you don’t know, a Wreck This Journal is a journal made for people who have a hard time finishing a journal or want something more to work with than a blank page. It’s definitely not a conventional journal and unlike most conventional journals people don’t seem to have any problems writing in it. I know a couple of people who have gotten Wreck This Journals and they gleefully follow the instructions practically from the moment they open it. 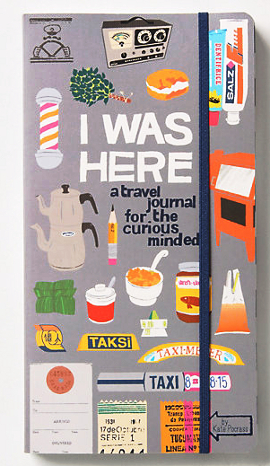 I’m guessing the I Was Here travel journal hopes to be an interactive journal along the same lines. Judging from the pages that I saw I’m not sure if it quite lives up to the fun of a Wreck This Journal, but still no doubt for most people it would be leaps and bounds more fun than a blank journal. And plus, it would give you ideas for experiences (and travel stories) on your trip you wouldn’t have had otherwise…and give you a one-of-a-kind keepsake to take back with you. Hi Honey :), Haha yeah I know what you mean. It would be cool though to have a goal to fill out the entire book no matter what, either on a single long trip or over various shorter ones. I bet it would make for some awesome/funny stories too as time went on and only the hardest ones were left. 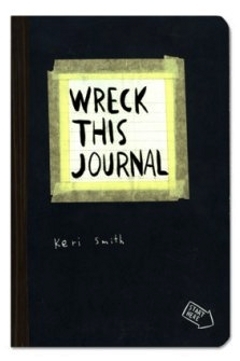 I’d like to try out a Wreck This Journal style travel book like this…I just don’t know if this is the one I want or not. When I get the time I’m going to look up more travel journals like this one and see what they’re all like. Cool, I’m sure she’ll like it! Also, agreed that it’s an awesome idea. Wish I had one of these when I went to Indonesia, it would have been a fun way to bridge the language barrier and would have been a great keepsake to reminisce with. But at least I’ll have it in mind for the next overseas trip :).